Home bbloggers beauty beautybloggers cosmetics irishbbloggers irishbloggers lipstick makeup newbloggers news tips tricks 5 Beauty hacks everyone should know! 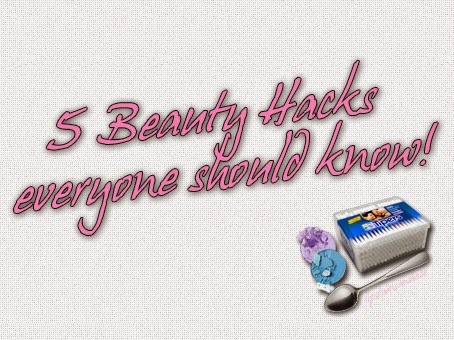 5 Beauty hacks everyone should know! I thought I'd do a post on "Beauty hacks" ie. beauty tips everyone should know. Here are some tips and tricks I've discovered over the years! To make any lipstick matte, tear one sheet of toilet paper until you have only 1 ply. Place the thin sheet over your lips and using a brush, brush some translucent powder over your lips. This will give any sheer lipstick a matte finish. However, if you just want your lipstick to last longer.. just apply another coat of lipstick over the translucent powder and it should make it stay on longer. I know everyone has their own tips and tricks when it comes to trying to achieve the perfect winged eyeliner. Some of the things that I've tried are.. Use some tape. Cut a small piece of tape and dab it with your finger so it's not too sticky. Line it up against your eye where you would like to apply your eyeliner. Apply your eyeliner along the crease of the tape and when you remove it you should have mess free perfect winged liner! Another way to apply perfect winged liner is to use a spoon or a card (bank card, ID card etc) and it will also give you the same result of perfect liner! I found a handy DIY storage that you can use for small products such as nail varnish that almost everybody will have in their house. Finished with your cotton buds? Use the small plastic case that they come in to store your nail varnish. You can even design them if you like using paint or even your nail varnish! This is a handy way to keep all your nail varnish tidy and in the one place where it's easy to find. Do you ever have those days where your hair goes completely static and trying to brush it just makes it worse? Just use a dryer sheet. I know it sounds crazy, but just rub a dryer sheet over your hair and the static should go away! I'm sure most people already know this one but for those of you that don't here's a tip to make your eyeshadow pop/brighter. Use a white base and then apply the eyeshadow over it to make the color stand out more. NYX Jumbo Eye Pencil in Milk is perfect for this in my opinion, see it here. It's happened me so many times that I've dropped and ruined one of my favourite eyeshadows or powder products that I've just bought or spent a fortune on. I somehow managed to drop my UD Naked 2 palette a while ago and two of my favourite eyeshadows fell. To fix them I gathered up as much of the eyeshadow that I could and placed it back into the container for that eyeshadow. Then, getting a sheet of tissue paper I placed it on top of the eyeshadow and applied pressure until the eyeshadow moulded together again. Apply enough pressure and the eyeshadow will be like new again! These are just a few of the beauty hacks I think everyone should know. Have any tips and tricks yourself? Leave them in the comments below!